Wilhelm Backhaus's first Beethoven Piano Sonata cycle, recorded between 1950 and 1953, was one of the first for the Long Playing record, and may well have been the first of several contemporary accounts to reach completion. Backhaus was already considered, as the review above points out, a "veteran" pianist, yet later that same decade he started the sonatas all over again, once more for Decca, this time in stereo, a cycle which he almost completed prior to his death in 1969, leaving only the Hammerklavier not re-recorded. The existence of the stereo cycle has led to this mono cycle, which a number of listeners consider the better of the two, to be neglected by Decca - outside of Japan and a very limited Italian issue, it has never been reissued by the company. Sonically there's no doubt that the later recordings improved considerably over these early 50s mono versions, but there's much that can now be achieved in improving considerably the sound quality of these recordings, as well as correcting the "slight mechanical erraticisms of pitch and surface-hum" referred to in the review above. 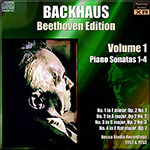 In making these historic recordings, from one of the greatest of Beethoven interpreters, available again in fine-sounding 32-bit XR remasters, collectors can at last and with ease determine their own preferences with regard to the Backhaus discography. Finally a note about pitch: The recordings so far analysed suggest some wayward tape speeds, resulting in pianos pitched variously at between A=432 and A=444, as well as some notable pitch changes, both sudden and sliding, during movements within recordings. One later recording in the series (to be released as part of Volume Three) includes what I take to be a "sticky edit", causing the pitch to lurch alarmingly (at one point it drops more than a semitone) over the course of several notes before steadying itself. Previously just about unfixable, these problems have all been resolved and the pitch of each recording standardised to A=440. A few weeks ago I was trawling through the thousands of records here at Pristine, looking for inspiration, and out of curiousity dug out a box set of Backhaus's Beethoven sonata recordings. A quick flick through them revealed that although the majority would be off limits due to their recording dates, a handful had fallen into the public domain. But would I be able to bring anything to them? I started with a couple of test transfers and they sounded promising. Certainly they seemed to have potential. But what a shame the entire set wasn't ever going to be possible, as a result of the changes in European copyright law due to take effect in the next year or two. Of course there was the earlier, mono collection - which might indeed hold more promise of remastering improvements. I decided to check when Decca had last reissued them so that I could download a few samples from iTunes. I searched and searched, but they were nowhere to be found. So I started doing some serious digging around, scouring discographies and old Internet discussions on the subject, and was astonished to find that, despite some people swearing by them as the better of the two cycles from Backhaus - and the only complete one, as he died before the final recording of his stereo cycle could be made - there had been no CD issue outside of Japan and an exceptionally rare Italian issue (which, confusingly, had the same catalogue number as the stereo cycle, leading me to wonder whether the Italian release was in error). I suppose this isn't entirely unusual. We've remastered a number of mono Mercury recordings over the last couple of years which have been passed over by the company themselves in favour of reissuing their stereo back catalogue. A lot of recordings fell into a bit of a mono "black hole" in the early-to-mid 1950s, and surprising as it seems for such an important release - possibly the first complete Beethoven sonata cycle of what you might call the "hi-fi" age - Backhaus's only truly complete cycle is one of them. The recordings were all made in Victoria Hall, Geneva, Switzerland. They began in July 1950 (Nos. 12, 21, 30), with the first six recordings being issued both on 78s and LPs, before dropping the 78rpm releases for the third batch of recordings, made in April and May 1952. And what a marathon that proved to be - Backhaus set down 11 of the sonatas during those sessions. Possibly this was too much for him, as he returned to Victoria Hall six months later to re-record three of them. Ironically, the next entry in Decca's Geneva recordings discography after this mammoth session, which took place in May 1954, bears the following prefix: "These were Decca's first stereo recordings". What a shame for Backhaus, who'd be going through the whole thing again a very few short years later - and already well into his mid-seventies. So what do we make of the earlier sonata recordings. Well I'm going to reserve comment on performances because (a) I've not heard them all, and (b) there are far better experts than myself who will no doubt pass judgement in due course. Contemporary reviewers' reactions in many way mirror those for the Schnabel series twenty years earlier - a mixture of rapturous approval and some quite pointed criticism. Whether the years since their recording have changed opinions generally or specifically remains to be seen. Backhaus certainly had heritage and was already a seasoned "veteran" performer (to quote from a Gramophone reviewer) by the time he began the first cycle, at the age of 64. Technically there are few surprises. The sound quality Decca achieved in its Geneva recordings of this period has never particularly excited me - they're just not on a par with what they were capable of in London at the time - but they're adequate as far as the early years of high fidelity tape are concerned. They've certainly benefited from a good dusting off with XR remastering putting some real life back into the rather dull, dusty originals, but it's been a constant battle against hiss to do so. Pitch also has proved erratic. On one movement of the first four sonatas I spotted a clear change of pitch midway through, as a result of a tape edit. Elsewhere another bad edit meant the same note was effectively struck twice. All of this is correctable today, as is the wobbliness of pitch in the Third Sonata, and the wide variation of tuning frequencies heard across the sonatas - of those analysed so far I've seen them range from A=433 up to A=444, something which seems more likely to be caused by slight inaccuracies in tape record and replay speeds than the piano itself. For the sake of argument I'm adjusting them all to A=440 and leaving them there. Thanks to a combination of tempi and choices of repeats, we should be able to get all 32 sonatas, in order, onto 8 CDs rather than the 10 of the Schnabel series. Thereafter we'll see what we can do with the rest of the recordings - concertos and variations - that Backhaus made during this era, ultimately making up a set which includes all five concertos, all 32 sonatas and the Diabelli Variations. When I was growing up in the early 1960s, Wilhelm Backhaus was generally known as a finely chiseled but somewhat lightweight pianist, best suited to the music of Chopin and Mozart. Thus it was a considerable surprise when he recorded an exciting, beautifully shaped performance of the Brahms Piano Concerto No. 2 with Karl Böhm conducting; even critics with a longstanding antipathy toward Backhaus raved about that recording, and with good reason. Because of this, I decided to consider reviewing CD 1 of Pristine’s restoration of the pianist’s early mono Beethoven cycle. Sonata No. 3 was recorded in 1952, the others on this disc in November 1953. Restoration engineer and annotator Andrew Rose indicates that the original recordings, despite having been made by a major label, were beset with technical problems. In addition to those mentioned in a contemporary review of one of the LPs—“the tone sounds hard in the development section,” “slight mechanical erraticisms of pitch and surface-hum”—Rose also mentions “some wayward tape speeds, resulting in pianos pitched variously between A433 and A440.” Whether or not this was due to tape slippage when originally mastered, or actual differences in the pianos that Backhaus played (there were still, in Germany at that time, some instruments pitched below A440), Rose has consistently pitched all of the Backhaus recordings to our modern standard. Without knowing what the rest of the series sounds like (this is my first hearing of these recordings), I can attest that Backhaus’s performances of the opp. 2 and 7 sonatas are, in general outline and feeling, very similar to the recordings of Irish pianist John O’Conor, with some differences. Those differences are a little more obvious ritards and rubato than that employed by O’Conor, with the result that some of the movements in these performances have a decidedly Old World feeling to them (one such example is at the 3:15 to 3:30 mark in the last movement of the First Sonata). On the other hand, Backhaus’s occasional “stop-and-listen-to-this” moments are not nearly as exaggerated as those of Wilhelm Kempff, whose Beethoven sonata cycle was all the rage in the 1960s. Indeed, as this set of the first four sonatas proceeded to play, I found myself charmed by his conception of these early sonatas. My only caveat, as is the case with O’Conor’s cycle, is that Backhaus fails to make as much of the sharp dynamic contrasts written into the scores, which Artur Schnabel and Craig Sheppard bring out so well (Schnabel at the proper brisk tempos, Sheppard a shade slower). Thus the reader of this review is faced with a bit of dilemma. Does one really wish to start collecting this early Backhaus cycle? He did rerecord every sonata except the “Hammerklavier” in stereo for Decca, and that cycle is currently available as a boxed set. Rose indicates that many listeners consider this earlier, mono cycle to have been the better of the two. Yet if you have part, or all, of the Schnabel cycle (I particularly recommend his reading of the early sonatas, at least 1–12 plus the op. 49, which was written earlier) and either the complete O’Conor or Sheppard cycles, you may not feel a pressing need for Backhaus. I don’t really know how the later discs of this series will play out, but I will say this: If his performances of the “Pathétique,” “Waldstein,” “Appassionata,” “Les Adieux,” and, yes, even the “Hammerklavier,” not to mention all the important sonatas in between, are as good as his stereo recording of the Brahms Concerto No. 2, you may want to opt for Backhaus in your collection. I, for one, will be looking for the further issues in this series in order to make my determination. This article originally appeared in Issue 35:6 (July/Aug 2012) of Fanfare Magazine.